Nail art is not my forte – I love how it looks, but frankly just don’t have the time or inclination (or the steady hand or creative talent…) to create mini works of art on my finger tips. I’m pretty much just pleased with myself if I manage to paint my nails without it looking like a three year old did it. So when there are nail-art like false nails on offer when I want to go totally over the top (pattern AND glitter – yes please) for Christmas then I am a happy girl to go for the stick-on option. 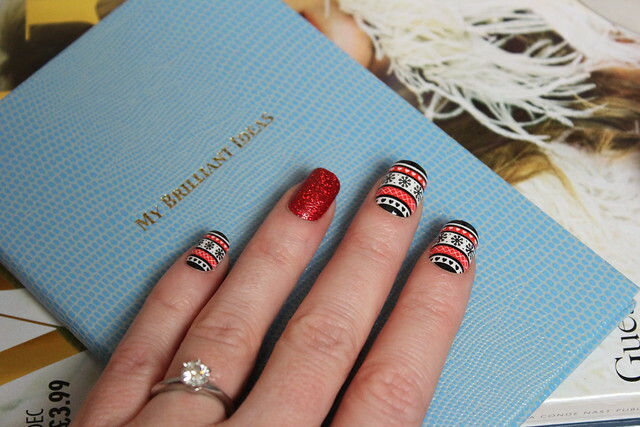 It’s quick and looks fab… a Christmas jumper on my nails?! What could be more perfect for Christmas eve?! Having the two festive choices of patterned or full on ‘Dorothy’s ruby slippers’ level of glitter I decided that it was time to go for not one, but both…opting for pattern as the main theme and glitter for an accent nail. Either would look great all of one or the other – but I wanted both, so went with it. I think the shape of the patterned ones is that bit shorter and they feel a little more comfortable to wear. I feel like I need to trim/file the red glitter one a bit as it’s quite long for my nail-tastes… but overall. These nails are awesome. Happy almost-Christmas! I hope you’re enjoying the creamy ones from the quality street tin whilst watching Elf/Home Alone/Muppet Christmas Carol…. basically my ideal Christmas eve! These look amazing! I made the mistake of doing my Christmas nails before bed last night and of course woke up with smudgy fingernails, I think I’d rather go for cute stick ons like these! I love these nails! I am like you and always make a mess of painting. I’ll have to look into these!